Since the first beam went up on this massive structure in Downtown Minneapolis, U.S. Bank Stadium has been building to this moment. 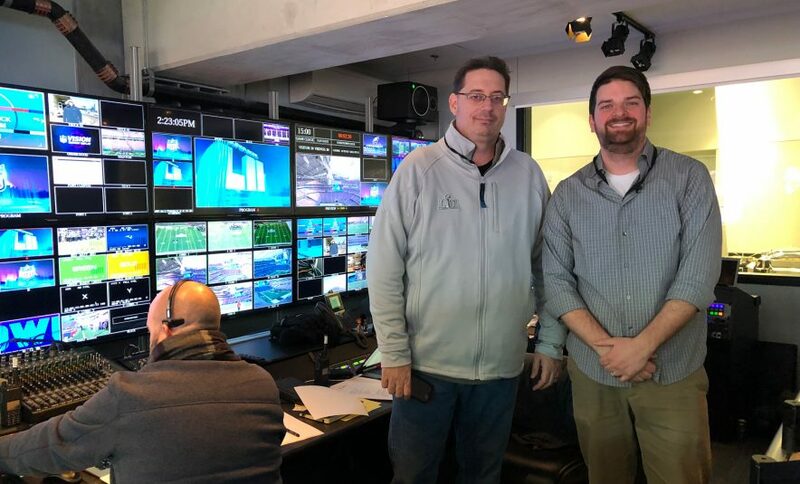 Super Bowl LII is here, and an all-star team from Van Wagner Sports & Entertainment Productions, stadium manager SMG, and the Minnesota Vikings is ready to put on a Super Bowl videoboard production for the ages. U.S. Bank Stadium in Minneapolis is playing host to its first Super Bowl. 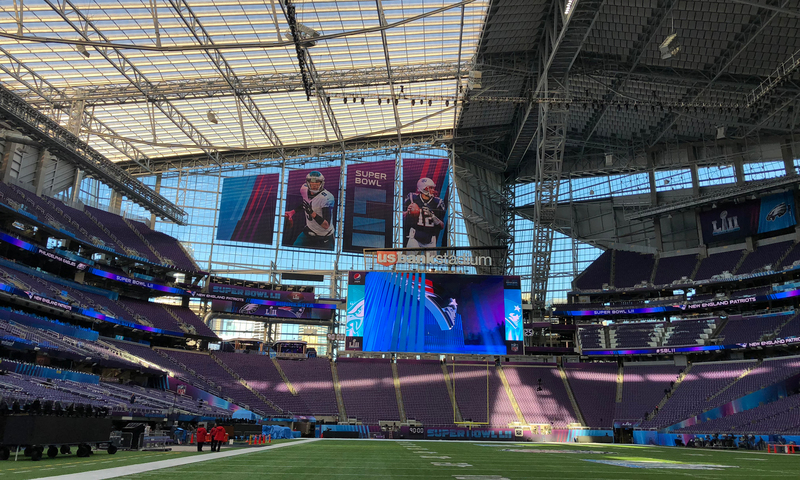 When 66,000-plus pack into the sparkling bowl, they’ll be treated to quite a few in-venue firsts on those boards, including the Super Bowl debut of SMT’s Yellow 1st & 10 line, a completely new Super Bowl LII graphics package, and an expanded arsenal of camera angles. The stadium’s crown jewels are a pair of Daktronics video displays behind the end zones that measure 68 x 120 ft. and 50 x 88 ft., respectively. This year, for the first time at a Super Bowl, those boards will feature a full complement of the Yellow 1st & 10 line. SMG and the Vikings had a standing relationship with North Carolina-based SMT throughout the season, offering the yellow line encoded on their 50-yard-line camera. For the Super Bowl, they chose to expand it to include the other main cameras at each of the 20-yard lines. 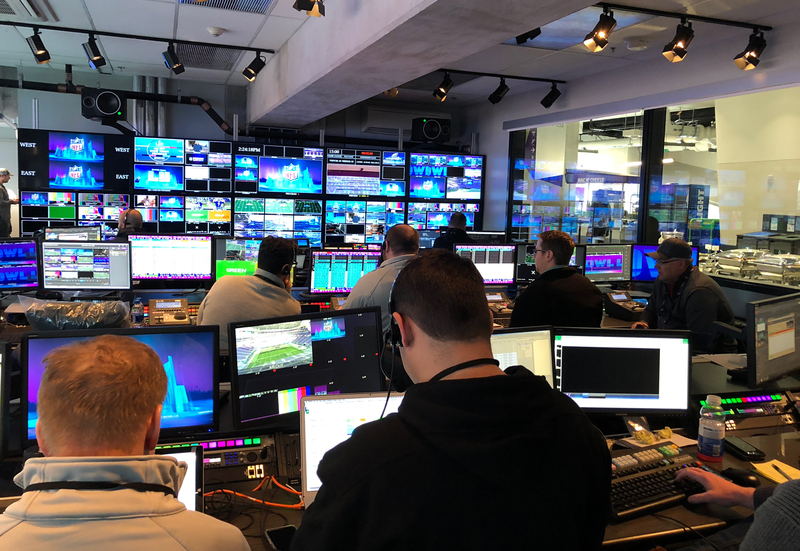 SMT’s Ben Grafchik will be sitting at the front of the control room, calling up specialty data-driven graphics, tickers, and data feeds for the control-room crew to call up as they desire. Those advanced graphics are part of a completely fresh graphics package that Van Wagner has developed for this game. It’s the classic hard work done by the company: build a season’s worth of graphics to be used on a single night. Also, not only does Van Wagner come in and take over the U.S. Bank Stadium control room, but its team has basically torn it apart, pulling out gear and replacing it with specialty systems in order to take the videoboard show to that next level. A crew of nearly 100 people are working the in-venue show at Super Bowl LII at U.S. Bank Stadium. One of the vendors that has gone above and beyond for the control room is Evertz. The company has provided a crosspoint card for redundancy and the EQX router while also supplementing with some spare input cards, output cards, and frame syncs. It’s a challenging effort to make temporary alterations to the control room, but SMG and the Vikings have welcomed the opportunity to expand with open arms. Normally, the control room features both Evertz IPX and baseband routing, an 8M/E Ross Acuity switcher with 4M/E and 2M/E control panels to cut secondary shows, and Ross XPression graphics systems. The all-EVS room houses a wide range of EVS products, including three 12-channel 1080p replay servers, one 4K replay server, IPDirector, Epsio Zoom, and MultiReview. For the Super Bowl, the control room will have more cameras to choose from than it has ever had before. A total of 18 in-house cameras deployed throughout the bowl (which is more than the normal eight for a Vikings game), including four RF handhelds, an RF Steadicam, and two robotics. The crew is also an impressive sight to behold. Nearly 100 people are working on the videoboard show in the combined efforts between Van Wagner, SMG, and the Vikings. There’s also a handful of editors across the street in the 1010 Building (where many broadcasters have set up auxiliary offices) cutting highlight packages and team-specific content. “This is the biggest event in the world,” says Becker, “and we and the NFL mean to acknowledge that. We’re willing to do what needs to be done to put on the biggest event in the world.